My black chicken disappeared today. The three chickens were out in the side yard, foraging, and I was in the front yard setting up some agility equipment for my dogs. I heard chickens Ginger and Bertha squawking so loud that I came over to see. It was just the two of them so I went to look for Penny, the black Australorp, my favorite. Usually if there's squawking, it's one chicken who got separated from the other two. I've watched before as one chicken squawks, the other two will mosey on over to her. But that wasn't what happened this time. Down the hill I found a pile of feathers. Further along, another pile. 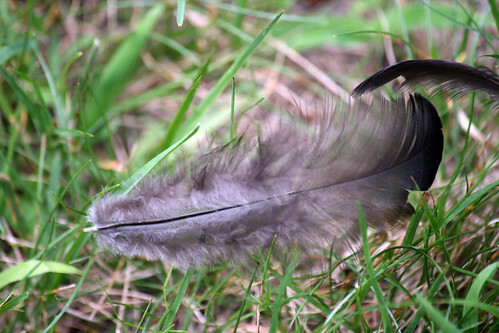 One last feather by the woods near my vegetable garden. I looked in the woods but never found her. I worked in my garden a couple hours after that, hoping Penny would show up but she didn't. I think it must have been a large animal to carry off a full grown, 5-7 lb chicken. I've seen a small coyote in our yard and a fox. My husband saw a big coyote. I'm told the big coyote has been seen by neighbors walking down the road. I suppose it was him who got my chicken. It was midday, broad daylight, about 2 pm. We came home one day a few years ago and we'd lost a duck my wife rescued two bantams and three chooks. Never worked out what or how but it knocked us around for a while. So sad! Especially since it was your favorite. So sad to lose a hen. Espeically an Australorp who are so friendly! Have lost many hens over the years. Fortunately my children are now old enough that we no longer need to hold a funeral for the deceased hen! Can you not use your dogs as bodyguards for your chickens? Sorry for your loss. Sorry to hear about your little chicken. I raise ducks and had a fox carry one off right in front of me. Thanks for all the condolences. I suppose since its my first lost chicken I am sad. Also, feeling responsible as I didn't mean to feed my chicken to wildlife. Yes, my dogs are good guards, but at the time, we were around the corner of the house. Still hard for me to believe an animal picked a chicken off at that time. My dogs were hanging around the driveway watching traffic not chickens. My mom thinks it was a fox. Another person I spoke with is sure it was a hawk. I don't know, I still think coyote. We had a large coyote watch my dogs and I in the middle of a sunny day one winter in our yard. We went inside and it came right up to the house to scout out more, if they are hungry enough they will not be spooked easily. So sorry about Penny (I had a black Australorp named Penny too because she looked like a penguin when she was a chick). It may have been a hawk. I lost my Buff Orpington to a hawk.